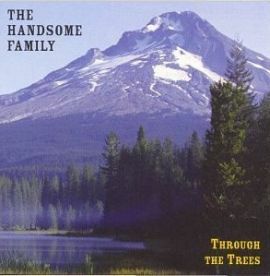 The Handsome Family’s third album, 1998’s Through The Trees, is an essential, Americana, genre classic. The music of the husband and wife duo, Brett and Rennie Sparks, hovers in a sphere somewhere between traditional folk and the more experimental leanings of alt.country. When it comes to murder ballads, there is no one I would rather hear sing them. They own their material in a way that comes across so real and potent, it’s as if they had lived out every story and scenario illuminated by their lyrics. While the music itself may sound as if culled from another time, the stories within the songs themselves take place in our world, or a quasi Lynchian world not too far off, with it’s characters mundane lives transformed into Faulkner-like tragedies. To get an idea, listen to “Weightless Again,” my favorite track off Through The Trees. A song about the redwood forest, coffee, and suicide. And to go along with this whole Southern-gothic persona, the two of them are the nicest folks you ever could meet. Their stange banter is usually quite funny as well. I did a phone interview with them last year and had a wonderful time talking with them. I’m with you – “Weightless Again” is practically the first song of theirs I ever heard and it blew me away from note one. The only song on that album that competes with it is “My Sister’s Tiny Hands,” as far as I’m concerned. That song gives me chills for days. How great was their performance of “My Sister’s Tiny Hands” in Jim White’s movie? I saw The Handsome Family perform in Amsterdam just last week, and they were great, again. It kinda is a shame that their music seems to get so little attention, in Amsterdam anyway. i agree. i have loved that song since 98 and it still sounds so fresh and so bone chilling. thanks for sharing.